We know that when it comes to sports bras, it’s important to have the right blend of style, comfort, and function. No matter the support level, workout type, or style preferences, find the Reebok sports bra that’s right for you. 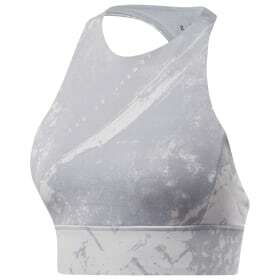 Reebok offers a variety of light, medium, and high-support sports bras to choose from. How do you choose the support level that’s right for you? For low-impact workouts like yoga, pilates, barre, weightlifting, and walking, our light-support sports bras offer style and comfort with just the right amount of support. For workouts that have a little more impact, like HIIT workouts, dance, or group exercise classes, our medium-support sports bras could be a better option for you. Finally, for high-impact activities like running, our high-support sports bras offer the coverage and control you need to help you focus on your workout, and not on your sports bra. Why choose between function and fashion? Our collection of strappy sports bras offer the best of both worlds. You can also choose between a variety of features like adjustable straps, removable padding, racer back straps, and even full coverage bra styles. 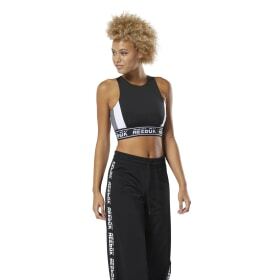 Check out all of our women’s workout apparel to find the right outfits for your gym routine. Mix and match your sports bras with our tank tops, t-shirts, leggings, and more.